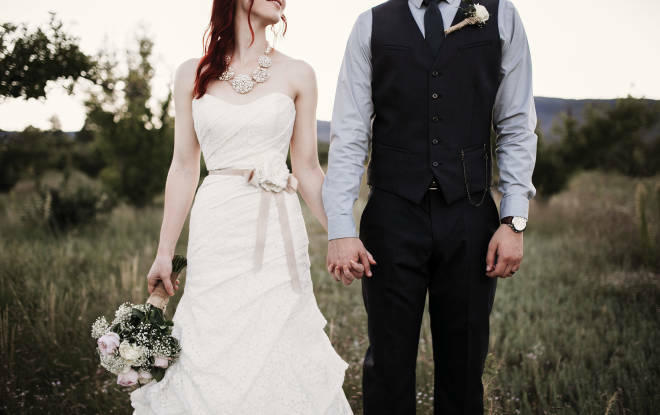 These couples poured the Land of Enchantment into their precious wedding days. Albuquerque photographer Elizabeth Wells captured their favorite moments. Jaclynn and Daniel Dodge joined their hands in marriage amid the meadows and forested greenery of the Manzano Mountain Retreat, southeast of Albuquerque. Ryan And Amanda Marshall of Santa Fe wanted a rustic, artistic setting for their March 2016 wedding and found it at Ghost Ranch, a retreat center near Abiquiú. For Ryan, a geologist, and Amanda, who runs an event-design company, the ranch made the cut, with its acres of stunning Southwestern vistas made famous in the paintings of Georgia O’Keeffe, and it can host up to 350 people in simple lodgings. Most of their wedding guests, about 75, chose to spend the weekend at the ranch and make a mini-vacation of it. The Cool Factor: The piñon-studded hills and windswept mesas gave Ryan and Amanda the middle-of-nowhere feeling they were looking for—without the hassle of having to arrange for things like water, power, and portable bathrooms. They spoke their vows in the courtyard of the property’s Agape Center, before a crackling kiva fireplace, while the bride’s brother led a group of cellists playing on a balcony above. The Flavors: The wedding meals felt welcomingly casual and New Mexican. That morning, Ryan and his groomsmen whipped up breakfast burritos for everyone, cooking bacon and eggs in propane-fueled disc grills they’d brought with them. For dinner, the couple had picked up trays of enchiladas, beans, and rice from legendary Albuquerque restaurant El Pinto, where the then-chef was a family friend. They added tamales from Posa’s El Merendero, in Santa Fe, and put out what they call an “easy cheesy” buffet. A handful of servers, recruited through a friend, refilled glasses, cleared tables, and helped clean up. Surprise! : Just hours before the ceremony, the couple and some guests decorated the reception hall. The final touch: a giant disco ball Amanda had picked out to emphasize the party mood. Ryan and a cousin carefully positioned the ball, and just as Ryan was tightening the knot, the string broke. Lights they’d strung below shattered as the ball crashed into a table, and knocked everything onto the floor. After a brief moment of shock, the crew rallied and cleaned it all up. Five minutes later, the mess was a memory (and a memorable story). Travel Tip: Ghost Ranch has no televisions or telephones, limited maid service, and a dining hall open only during certain hours. The couple’s grandmothers chose to stay at the nearby Abiquiú Inn, with free Wi-Fi, kiva fireplaces in every room, and an all-day restaurant. Facing the Music: Because Ghost Ranch offers full audiovisual services, the couple skipped the DJ and plugged their iPods into the system—an easy, low-cost way to set the mood. During cocktails, they mellowed out with a folk-tinged singer-songwriter playlist including Johnny Cash, James Taylor, and Gillian Welch. To get the guests moving, they hit it with their favorite dance songs, including some that were meant to come on only after the party thinned out to just the younger folks. It didn’t, of course, but the grandparents managed to survive a few tracks by Ludacris and Snoop Dogg. Chelsea Wrightson, who works at an Albu-quer-que art gallery, and Ben Wood, a high school teacher and musician in Albuquerque, wanted a wedding venue that felt comfortable, creative, and uniquely New Mexican. Old Town’s Casas de Sueños inn perfectly fit their style, their budget, and their 80-guest ceremony in September 2014. The Cool Factor: Although it’s just a few blocks from Albuquerque’s Old Town and busy Central Avenue (the former Route 66), the heart of Casas de Sueños is a surprisingly serene courtyard with a romantic gazebo shaded by tall trees. Red chile ristras hang from dark wood vigas, and bright hollyhocks bloom in front of warm adobe walls. Winding paths, hidden patios, and lush gardens connect the inn’s 21 casitas, built in the 1930s and ’40s. The Flavors: The couple had loved a quirky North Valley restaurant called Ezra’s, which served ambitious New Mexican–accented food in an unlikely location: a bowling alley. After it closed, Ben and Chelsea tracked down owner Dennis Apodaca and asked him to cater the enchiladas and fresh salads they had loved from that and his other restaurant, Sophia’s Place. (In 2016 Apodaca opened a new Latin fusion restaurant called Maya Cuisine in downtown Albuquerque.) For cocktail hour, they created custom drinks, including a whiskey sweet tea, and pulled pints of pilsner from local favorite Marble Brewery. Surprise! : “It’s not a matter of what’s going to go wrong—it’s when,” Chelsea says, laughing. Casas de Sueños provided an event planner who helped organize things like the setup of tables and chairs. But when the day actually arrived, the couple wished they had chosen one close friend or family member with the authority to make a bunch of little decisions (like: Sure, tap the second keg!) so they could just keep having fun. One thing that went so right: Chelsea found the perfect antique dress online, then discovered the seller was Off Broadway, a vintage shop in Albuquerque’s Nob Hill. The 100-year-old embroidered gown was immaculate and fit beautifully. Travel Tip: Ben’s family is Jewish, so getting married on a Sunday made his mom happy—and it was easier to book a date at Casas de Sueños during a busy September. The wedding package included the honeymoon suite, with a private hot tub, six casitas holding up to 24 guests, and breakfast the morning after. Facing the Music: Ben plays banjo in a popular alt-country band called the Porter Draw. The band performs at a lot of weddings, where he says they get paid the best but listened to the least. So instead of putting someone else’s band through that, Ben and Chelsea asked two good friends to spin records, mostly soul music, and everybody danced all night. Gracious and historic, La Mesita Ranch delighted Eric Garduño and Geraldine Gonzales, along with their wedding party. Santa Fe natives Eric Garduño and Geraldine Gonzales wanted a wedding that would show off the autumnal beauty of northern New Mexico. 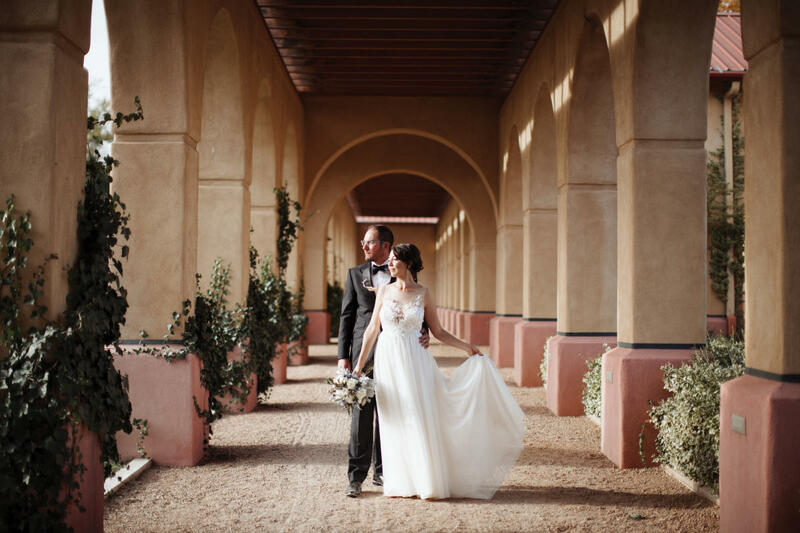 For their October 2016 ceremony, they chose the stately La Mesita Ranch, north of Santa Fe, and were blessed with the best weather Mother Nature could provide. Eric, an art gallery director, and Geri, a lawyer for the state, kept the details simple and let the landscape do the dazzling. The Cool Factor: The surprising thing about La Mesita Ranch is that almost nobody knows it exists. In the early 1900s, the land was bought as a Southwestern retreat for an industrialist who went on to found American Standard, the faucet-and-fixture company. More than 100 years later, the original owner—Pojoaque Pueblo—bought it back and offered it to guests through the pueblo’s Buffalo Thunder Resort and Casino. Nestled in the Nambé Valley, 15 minutes north of the capital, the ranch includes five adobe residences, including three designed by architect John Gaw Meem in the 1930s. All feature works by Pueblo artists. The Flavors: Eric and Geri didn’t want a fussy sit-down dinner, so they had Walter Burke Catering do a simple cocktail menu with Mediterranean flair—lamb meatballs with tahini, prosciutto-wrapped shrimp, and a warm artichoke dip. The small bites got people mixing and mingling. And Eric’s signature cocktails—including one made with bourbon and thyme-infused honey syrup—got them dancing. Surprise! : Everything seemed fine when the preschool-aged flower girl started down the aisle. But after just a few steps, she tripped and fell. Unhurt but stunned, she stood up and ran straight to her mom, one of Geri’s cousins. Sympathetic guests heaved a communal “Awwww!” After everyone confirmed she was fine, the procession continued. The highlight of the ceremony came when their officiant, a local artist, asked if her Hopi husband could deliver a traditional blessing. He pinned a feather on the bride and groom, then asked each to take a pinch of cornmeal mixed with ash, speak a prayer to it, and blow it into the sun. The couple found it extraordinarily meaningful and special. Travel Tip: Lower rates in the fall make La Mesita more affordable, and the couple negotiated a shorter minimum stay to save money. And because the setting was so stunning, with green alfalfa fields, graceful cottonwoods, and the soaring Sangre de Cristo Mountains in the background, they spent little on flowers or decorations. Mini-bouquets from Whole Foods that decorated chairs at the ceremony then adorned the cocktail table at the reception. Facing the Music: The couple asked for song recommendations on their RSVP cards, producing one of the most enjoyable parts of the planning for Geri. Along with her sister, she created several different playlists. Checking the mailbox every day to see who suggested Frank Sinatra or Grace Jones made them feel like their guests were a part of the process. They also hired a DJ who ended up going rogue, ditching their songs in favor of reliable crowd-pleasers. While sad that some of their songs went unheard, the couple admitted the DJ made the party more fun. Sandia Park couple Daniel and Jaclynn Dodge went to middle and high school together in Moriarty but didn’t date until after they graduated. She thought he had asked her out to catch up on old times; he showed up with flowers. Jaclynn, who works for a pediatric eye doctor, and Daniel, who works for T-Mobile, ended up having their first date at church. They found they had more than faith in common and married at Manzano Mountain Retreat in September 2014. The Cool Factor: Tall ponderosa pines and rugged cabins at Manzano Mountain Retreat serve as a refreshing antidote to Albuquerque’s noisy bustle, and its central locale helped draw guests from across the state. The high, green setting reminded them of other favorite places in New Mexico, like Red River and Ruidoso. For them it was “typical New Mexico style,” even without adobe or chiles. The Flavors: What could be better than barbecue to fit this casual setting? Rudy’s Country Store & Bar-B-Q, in Albuquerque, brought moist pulled pork, ribs, and brisket, along with traditional potato salad, coleslaw, and beans. That made the setup, service, and cleanup extra easy. Daniel’s aunt made a two-tier “naked cake” left unfrosted but generously topped with fresh berries. Dozens of cupcakes dotted with frosting, chocolates, and caramels filled out the dessert table. Surprise! : Like many budget-minded couples, Daniel and Jaclynn chose to do much of the setup and decorating themselves. That left them pretty exhausted by the time the ceremony came around. Their advice: Rent the property the day before the event, too, to gain time and lose stress. Travel Tip: Although the retreat is only about as far south as Belén, it can take an hour and a half from Albuquerque to drive through Tijeras Canyon and wind south to the secluded location, tucked in the foothills. Because of that, Daniel and Jaclynn secretly set the ceremony for 30 minutes later than the time on the invitation, just to make sure all 85 guests arrived in time. Facing the Music: As soon as they got engaged, Jaclynn started making playlists. At home they like folk and indie rock, so they added many of their favorites to the lists. Perhaps wisely, they decided to skip Daniel’s heavy metal collection, but she still hunted for instrumental covers of those songs. Friends suggested their favorite wedding tracks, like the Commodores’ funky “Brick House.” One singular choice: the 1977 Kansas hit “Carry on Wayward Son,” which they know as the theme song to the long-running fantasy-horror television show Supernatural.